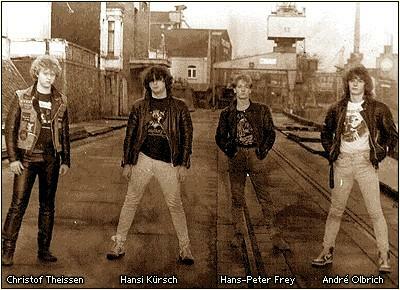 Blind Guardian was born from the idea of two young school friends: Hansi Kürsch and André Olbrich. At the beginning, the band was called "Lucifer's Heritage" and the line-up was composed of the 2 boys, Markus Dork (guitar) and Thomas Stauch (drums). The four friends release a first demo in 1985, "Symphonies Of Doom": no a masterpiece but it gives an idea of the kind of music that influenced the band and that they wanted to play at that time: a thrash/speed metal, like Helloween. One year after, the line-up has changed (Christoph Theissen and Hans-Peter Frey replaced Markus and Thomas), and a new demo was released: "Battalions Of Fear". This demo had a greater success than the first one, and the line-up changed once again, but is stable for 20 years: Thomen Stauch came back and Marcus Siepen replaced Frey. 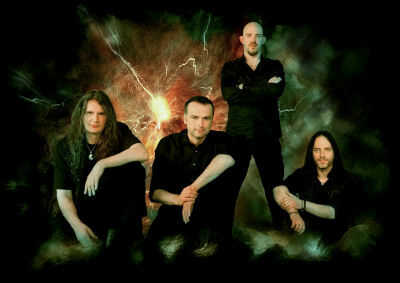 The name changed with the line-up, the band was now called Blind Guardian. In 1988, the first studio album was released: "Battalions Of Fear" (No Remorse Records), it's not a must-have but the album contains the song Majesty, still sung in the concerts today. A first tour followed this release, and from 150 to 300 fans came to see the 4 guys of Krefeld every night. In 1989, the second album, "Follow The Blind", was released, the music follows the first album, and it is generally presented as the worst album of the band, even if it contains the great song Valhalla, a hymn in the concerts. But Hansi had to undergo an operation of the appendicitis, the band had to cancel the tour for this album. "Tales From The Twilight World" was a great success and many fans today have begun to follow the band with this album. In Germany, Blind Guardian toured 3 weeks long, and at each show, the band played in front of 500 to 800 people. It's also with this album taht the band toured for the first time out of Germany: Switzerland and Austria discovered the 4 bards on stage. "Somewhere Far Beyond" is a great step in the career of the band, with keyboards in the music. It's also the album that brang the band to the top, even if it was a long way. Indeed, the album was in the top of the international charts, the band was very famous in Japan. Their tour in this country was huge, the band played in front of 4 000 people and knew for the first time the life of "rock stars". We also can notice that this is the first album released by Vrigin, as No Remorse Records fell during the "Tales From The Twilight World" tour. This tour in Japan gave birth to their first live album, "Tokyo Tales", produced by Kalle Trapp (and maybe a wink to the live album "Tokyo Tapes" of the german band Scorpions, released in 1978). In 1995, a masterpiece was released: "Imaginations From The Other Side", often presented as their best album. The promotion is huge: clip, mini-movie, objects... It is produced by Flemming Rasmussen (who also produces Metallica), it is still a masterpiece in the discography of the band, and one of the best albums of metal music for many fans. During its tour in Asia, Blind Guardian was the third band playing in Thailand, after Metallica and Bon Jovi. On "The Forgotten Tales", released in 1996, the band presents different versions of their own music, and covers of many bands (Beach Boys, Mike Oldfield, Uriah Heep), sometimes unreleased before. It also presents a famous song in concerts, which wasn't on "Tokyo Tales", The Bard's Song (In The Forest). It also gives an other look on their music. In 1998, with "Nightfall In Middle Earth", this success continued and the band toured more than for "Imaginations From The Other Side". The fans sang the chorus of Nightfall, Mirror Mirror or Time Stands Still (At The Iron Hill) like war hymns. The top of this tour was the journey (through the dark) in Central and South America (Mexico, Brasil, Argentina). "A Night At The Opera" was a new big change for the band, the music is more complex than in the first albums. Indeed, André said that with "Nightfall In Middle Earth", they had reached the top of this kind of music and that they couldn't do better, there fore they had to choose a new direction. "And Then There Was Silence" is considered by Hansi as the masterpiece of the band. The half of the production time was for this track. The tour for this album was a crusade : more than 80 shows in the whole world, in front of more than 2 000 people on average, but it could be 6 000 like at Philipshalle in Düsseldorf, where the crowd sang so loud that Hansi couldn't speak during 5 minutes. The atmosphere of these concerts is good shown on "Live", the second live album of the band. Their success was all around the world, the band began in front of 3 000 people, in Moscow they were asked to do a second show at the end of the tour, in England they headlined the Bloodstock Festival. It's also the first tour in North America, in cities like New-York, Los Angels, Chicago or Montreal. The "Blind Guardian Open Air", a festival organized by the band, finished a tour than more than one year. More than 6 000 bards from the whole world met at Cobrug for 2 days of concerts, one of Blind Guardian each night. The DVD "Imaginations Through The Looking Glass" shows these concerts. In 2005, the departure of Thomas, because of a different vision of the music that they made in "A Night At The Opera", and their contract with Nuclear Blast are a new change in their carreer. It's the young Frederik Ehmke that took place behind the drums, but he also plays other instruments, like whistle and bagpipes. The first single of this new era, "Fly", was released in March 2006 and the way chosen in "A Night At The Opera" continues, with complex songs, the album "A Twist In The Myth" follows this choice, even if the songs are very different the ones from the others. The tour began in May 2006 and finished in November 2007, and took place on the 5 continents. The band played 3 concerts in Spain during the summer of 2008. The same year they are also asked to play in the OST of a videogame, one of the dream of the band. Blind Guardian will make this dream true in Ascaron's Sacred 2. They did not only write a song for the game, the band was also modelised so that the game will feature a unlockable video of the band playing the song. Hansi gives you a quest to complete to see the first virtual concert of the band. The song is called "Sacred" and was played during the concerts the band made during summer 2009. It should appear in the next album, planned to be released during the second half of 2010. 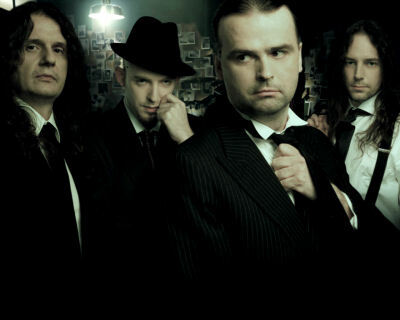 Blind Guardian entered a studio in October 2009 to record the following album of "A Twist In The Myth". The recording of "At The Edge Of Time" will be completed in April 2010. Blind Guardian saw things in big and for the first time a symphonic orchestra played with the band. The number as well as their field of expertise of guest is impressive. Who would have though that a tap dancer will participate in the recording of a ballad?